This week Rockstar threw a bit of a curveball in terms of DLC for Grand Theft Auto Online. Instead of bringing in new vehicles a pack of four vehicles that have been in the game since launch have been made available for purchase, one's that you couldn't own before. Joining these rides are discounts and a way to earn double rewards. The four old-new vehicles in question are all models that players should be familiar with - after all, we've been stealing the damn things for Simeon for years now. 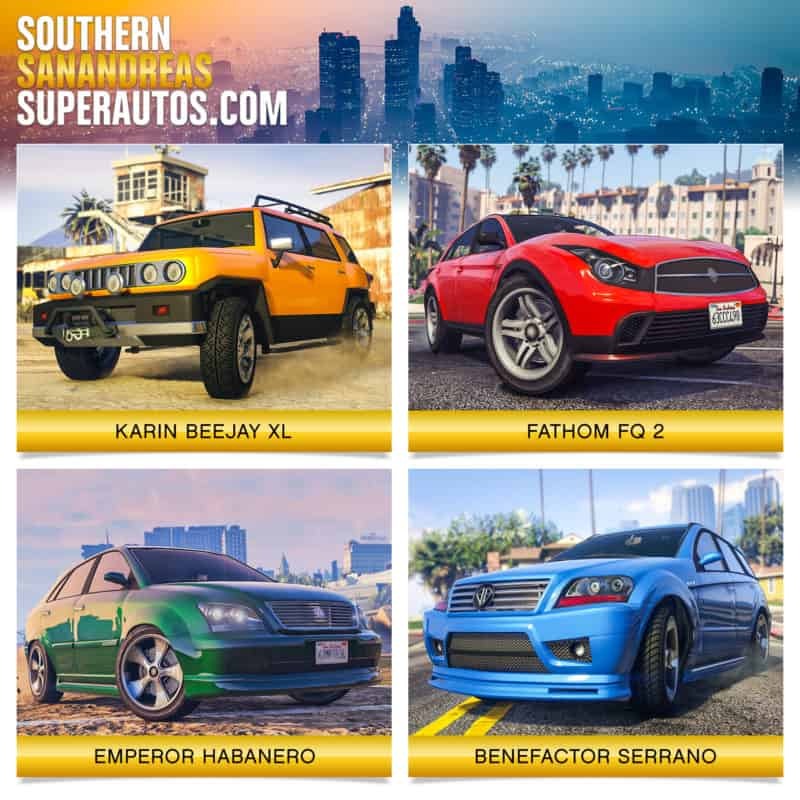 The Benefactor Serrano (GTA $60,000), the Fathom FQ 2 (GTA $50,000), the Emperor Habanero (GTA $42,000) and the Karin BeeJay XL (GTA $27,000) are now available to be bought, customized and upgraded. All are very reasonably priced which is welcome, if understandable considering their age and performance. None of them are outright bad in any sense and it's nice to finally get our own models of the cars we've been reappropriating since 2013. All four are available via Southern San Andreas Super Autos. Players logging in this week will get a pair of freebies for their loyalty. Continuing the trend of giving players nightclub branding themed clothing, this week GTA Online players will get a Gefängnis t-shirt for their wardrobe. 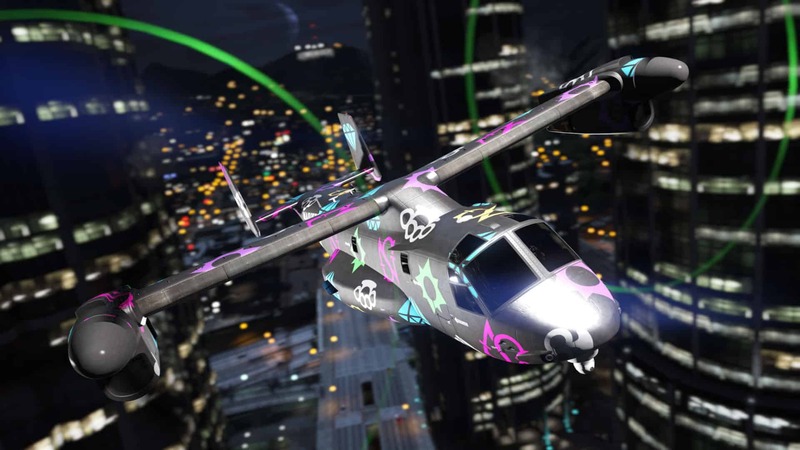 Once you've done dressing up, you can do the same to your Mammoth Avenger with the exclusive Sessanta Nove Multi-Color Livery. Trading Places (Remix) continues to pull double reward duty. Playing the new take on the old Adversary Mode will earn you twice as much RP and GTA$ as usual for the second week now. These remixed Adversary Modes are a bid by Rockstar to breathe new life into the experimental concept competitive modes in GTA Online. Additionally, Business Battles will yield double supplies, nightclubs get a 2x popularity boost and bunker research is given a 25% buff. Discounts this week follow the logical progression from recent events. In the past few weeks, entry business properties were frequently discounted giving newer players a chance to hop into GTA Online's higher level content at a lower cost. Now that they had the opportunity to sink their teeth into CEO and biker work, it's time for an upgrade. The 40% discount on bunkers and 25% discount on nightclubs and their renovations will help players do just that. A wide selection of vehicles and other items are also marked down. Body armor, MK II weapon upgrades, ammo and After Hours masks are all 25% off alongside the Imponte Deluxo. The Festival Bus, the Pegassi Tezeract, the Lampadati Viseris and the Canis Kamacho are all 30% off, the Ocelot Pariah, the HVY Barrage and the Ubermacht SC-1 are 35% and finally the Grotti Turismo R is 40% off. Check back next week to see whether the next Remixed Adversary Mode has been released.